What is Conhost.exe and why it is running on my computer? Is Conhost.exe eating too much of CPU and memory resources and slowing down your system? Are you wondering what Conhost.exe? Is it a legitimate and necessary process? Or is it a malware? If yes, this post is just for you. Here you’ll find answers to all your questions. Have a look. Conhost stands for Console Application host. Understanding Conhost will require you to go into the history of the Windows operating system. Conhost was introduced to thwart malware exploitation in Windows 7 and Windows Server 2008 R2. During the days of Windows XP, command prompt was handled by a process known as ClientServer Runtime System Service (CSRSS). CSRSS was a system level service with some security vulnerabilities. There were instances when malware exploited these security vulnerabilities. The crash of CSRSS would bring the whole system down, which as you may guess, made its reliability questionable. And this was not the only problem with CRSS. Another problem was that it could not be themed and the command prompt did not have interface elements (like scroll bars) then. The Conhost sits in between Command Prompt (cmd.exe) and CSRSS allowing Windows to fix the issues. With Conhost introduced Command Prompt had interface elements like scrollbars and it was also possible to drag and drop windows elements directly in Windows. For example, if you drag and drop any Word file in Windows, the result would the entire path of the word file would be copied in the command prompt. The primary objective of introducing Conhost was to provide something like Shell to the system-level CSRSS service to enhance its security and reliability and also grant it ability to integrate with modern interface elements of Windows. Is Conhost.exe a legitimate process? The genuine conshost.exe is a software component of the Windows operating system. The Windows operating system has at least one conhost.exe program located in “C:\Windows\System32” folder. Since it is a system-level process, you should not delete the file out of fear of a virus. Doing that may make your system unstable. However, you cannot completely rule out the possibility of some malware or virus concealing itself under the name of Conhost.exe. Malware or virus frequently uses the names of legitimate files to stay undetected and fool unsuspecting users. That said, if the conhost.exe file is located in the System32 folder, the security rating is only 4% dangerous. 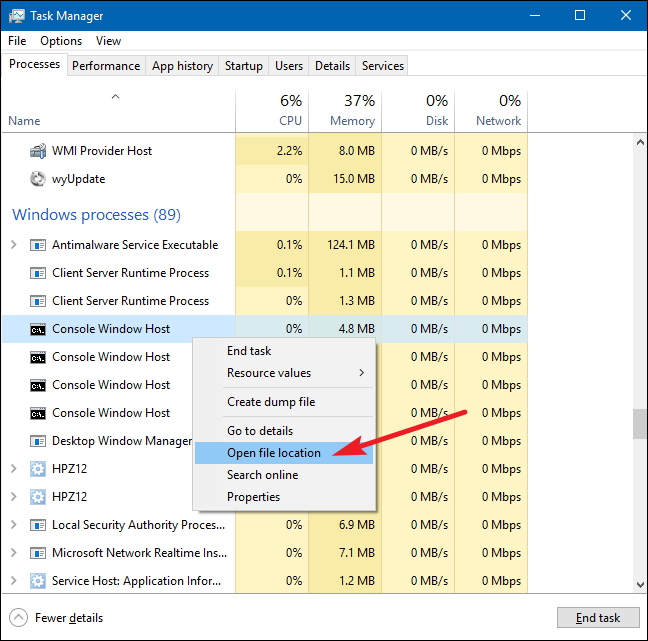 Why there are so many instances of Conhost running in Task Manager? It is quite common to see many instances of Conhost running in Task Manager. One of the Conhost.exe processes might be spawned by the Command prompt window. Each window of Command prompt will spawn its own Console Window Host process. Other programs that use the command line may also spawn their own Console Window Host process. You may not see any active windows of these programs on the desktop. For example, Plex Media Server app uses a background service that is used by many applications. Plex Media Server app uses the command line and it would spawn its own Console Window Host process. Could the Conhost.exe be a virus? As mentioned earlier, there is a possibility a virus is concealing itself under Conhost.exe process name. You can get your doubts cleared by checking the underlying file of the suspicious Conhost.exe process. If the file location is “C:\Windows\System32” folder, you can fairly be certain that it is not a virus and your fears are misplaced. 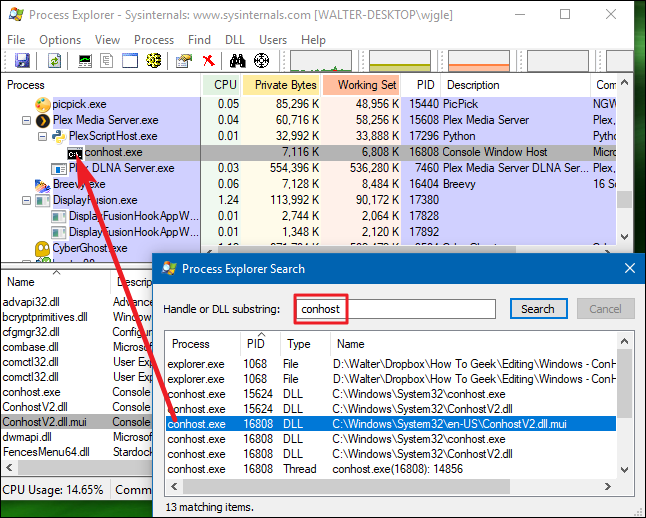 If the file location is something like %userprofile%\AppData\Roaming\Microsoft, there is a possibility, your system is infected by a Trojan Conhost Miner which conceals itself as Console Window Host process. You should immediately run a full system scan your Windows system to get rid of the Trojan.